Select a position to store the disk image. Anything accessible by Windows will be fine. If needed, an extension of ".SNA" will be appended to the filename. You may enter a comment to make life easier when determining which Image to restore, when disaster strikes. Usually you will not want the Recycle Bin (deleted files) to be saved, because this would enlarge the Image file. 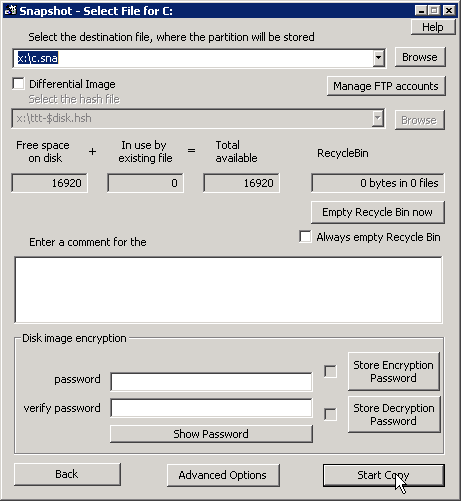 Marking this option will empty the Recycle Bin before the image is taken, to make the image somewhat smaller. That's easy - it starts the backup. The created Disk Images can be encrypted so they can't be used (browsed or restored) without knowing the password used to encrypt it. To store them encrypted, please enter your Password here; you have to enter it twice to protect you from mistyping it. With [Save Password], you can remember your password for this machine and this user, so that all later images will be encrypted with this password; also when reading an encrypted image, this saved password is used. If you want to use an encrypted disk image, and the saved password isn't valid, you will be prompted to enter it. If you forget your password, there's no way to recover it; you might as well delete your backup in such a case.